(Organic Slant) A new study from the Radiation and Public Health Project found that babies born in the western United States as well as other Pacific countries shortly after the Fukushima nuclear disaster in Japan in March 2011 may be at greater risk for congenital hypothyroidism. Babies born in places including Hawaii, Alaska, California, Oregon and Washington shortly after Fukushima were 28 percent more likely to suffer from the illness, according to the study, than children born in those same regions one year earlier. The illness, if untreated, can cause permanent handicaps in both the body and brain. “Fukushima fallout appeared to affect all areas of the U.S., and was especially large in some, mostly in the western part of the nation,” they wrote. 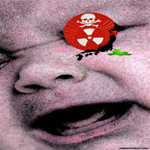 In Japan, the health effects associated with Fukushima are obviously much worse. The mortality rate of elderly people who were in retirement facilities near the nuclear plant has reportedly tripled. There has also been reported increases in the number of children with flat feet, thought to be the result of kids playing on radiated soil. Experts suggest that parents of children born in the western United States or Pacific regions in March or April 2011 get their children checked by a pediatrician for congenital hypothyroidism. Various reports indicate that the incidence of congenital hypothyroidism is increasing in developed nations, and that improved detection and more inclusive criteria for the disease do not explain this trend entirely. One risk factor documented in numerous studies is exposure to radioactive iodine found in nuclear weapons test fallout and nuclear reactor emissions. Large amounts of fallout disseminated worldwide from the meltdowns in four reactors at the Fukushima-Dai-ichi plant in Japan beginning March 11, 2011 included radioiodine isotopes. Just days after the meltdowns, I-131 concentrations in US precipitation was measured up to 211 times above normal. Highest levels of I-131 and airborne gross beta were documented in the five US States on the Pacific Ocean. The number of congenital hypothyroid cases in these five states from March 17-December 31, 2011 was 16% greater than for the same period in 2010, compared to a 3% decline in 36 other US States (p < 0.03). The greatest divergence in these two groups (+28%) occurred in the period March 17-June 30 (p < 0.04). Further analysis, in the US and in other nations, is needed to better understand any association between iodine exposure from Fukushima-Dai-ichi and congenital hypothyroidism risk.